Paul Dini & Bruce Timm’s masterpiece Batman: The Animated Series is pretty much the definitive Batman experience. When it came on the scene, it’s stylized visuals and compelling storytelling blew most other cartoons–hell… most other TV series, period–out of the water. However, the original toy line that came along with the series was a victim of the time. The figures were small, stiff, and lacking articulation. When I discovered this line was coming, I was extremely excited. 6″ scale figures in the Timm style, with seemingly decent amounts of articulation. 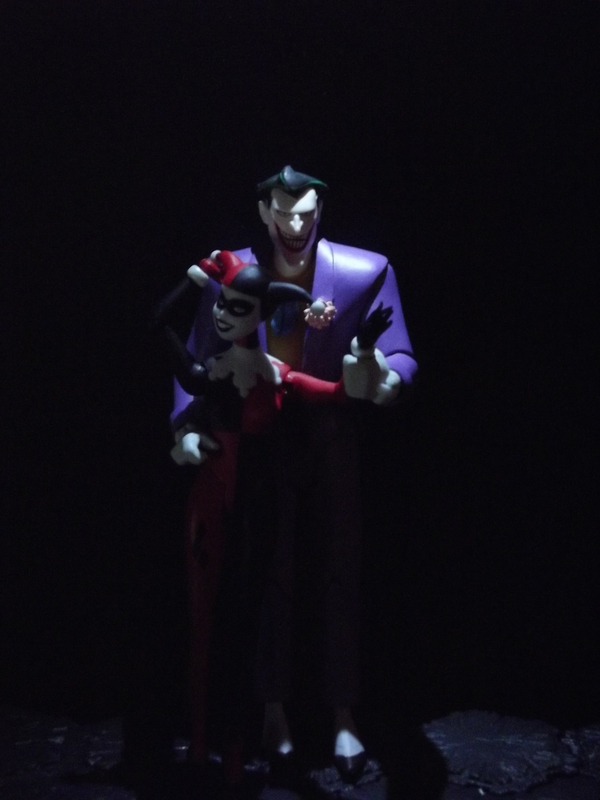 Joker and Harley were announced, along with the line’s first wave of figures. I was at my LCBS that day pre-ordering them. That was at least a year ago… I’m reasonably sure this is the longest I’ve had to wait for a figure I’ve ordered to arrive. But today, she’s out. I went to the LCBS almost as soon as it opened, partly because I wanted my figure, partly because I was afraid after 12 months or more they may have lost my pre-order before they were ever able to actually order the figure. They had. So, I grabbed one of the shelf anyway, and headed home. The last figure I was this excited for was the Masters of the Universe Classics Spikor figure. 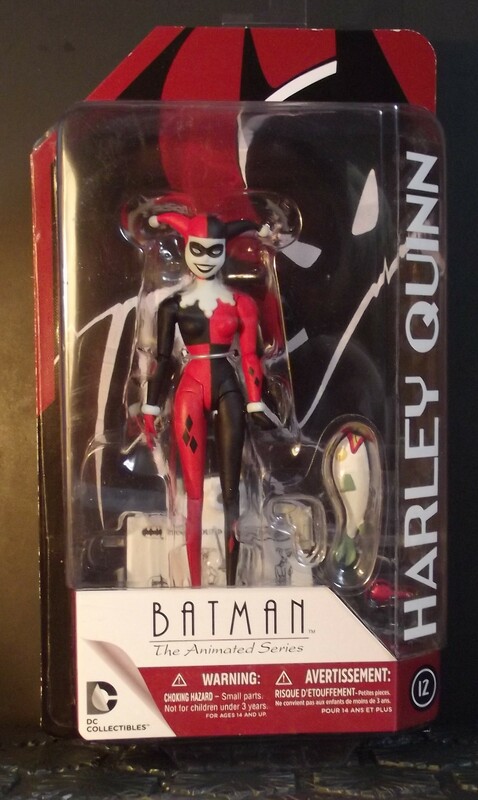 I’ve been looking forward to this figure because, basically, there are no good Harley Quinn figures out there. Not for me, anyway. There’s always something that’s a deal breaker. Usually it’s the outfit. I’m not a fan of most of her non-harlequin suit looks. However, even if she is in the right outfit, her face is a train wreck, the articulation isn’t there, her proportions are wrong… there’s always something. This Harley is not the exception to the rule… but let’s start with the positive. This figure is gorgeous. Her portrait and proportions are spot on to her B:tAS origins. 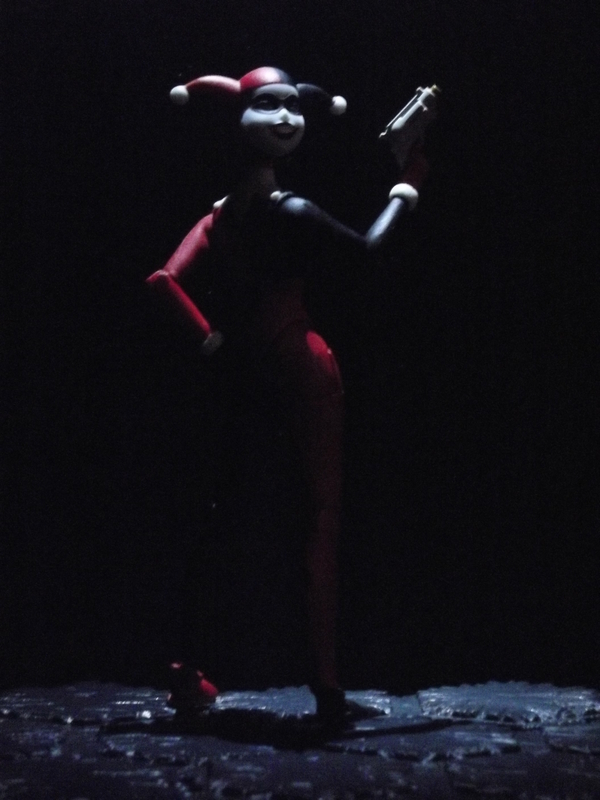 In my opinion, there hasn’t been a Harley Quinn figure that’s gotten Harley’s look this right. She could easily be jumping right off the page or screen and into your hands here. If you’re a boxed collector, there is nothing that should be stopping you from owning this figure right now. If you’re not a poser–if you like to just open and shelf your figures, she’s still a must own. She is absolutely perfect in every way… until you get her in your hands. The trouble with this figure–this line of figures, really–is that in order to achieve that perfect Bruce Timm design, they’ve had to make too many other sacrifices. As soon as you pull Harley out of her blister, you get the feeling she could break at any moment. I was certain I had broken, or was just about to break, Harley at least half a dozen times over the course of shooting pictures of her for this post. After a few poses, the paint around the joints of her knees and shoulders was starting to wear. As far as I can tell the pieces weren’t trimmed properly after they were manufactured. Again, if you find a pose and stick to it, this will never be a problem. I don’t mind grabbing the ol’ Sharpie jug and touching up here and there, but it does feel a little ridiculous to be doing that to a figure on the day you’ve opened it. Harley comes with a few accessories. She’s got 2 extra sets of hands, a popgun and a Joker fish. She doesn’t come with a giant hammer, which is surprising because in later years her and her hammer have become inseparable. I’m guessing, though, that since this is based on the series, and the hammer wasn’t really a staple of the B:tAS series. The perfect accessory, in my opinion, would have been Bud and Lou, the pet hyenas, but that didn’t happen. The articulation in this line is odd. By my old man 6-points-is-a-lot standard, there is a lot of articulation here (23 points, by my count). The problem is about half those points feel flimsy, and a quarter of them just look weird when you use them. 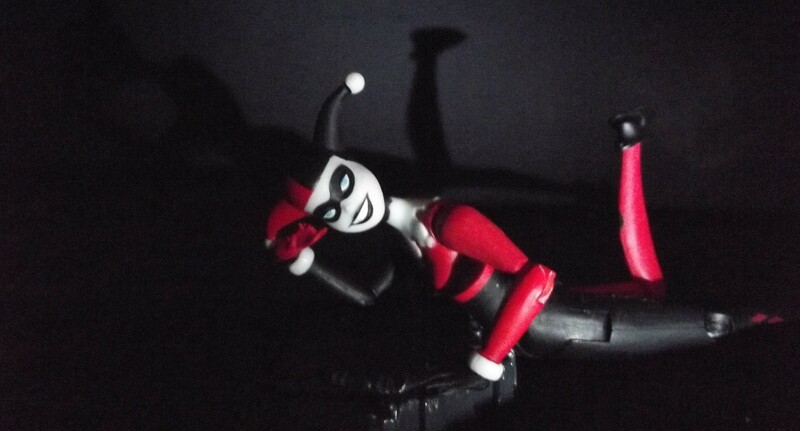 Harley is perfectly capable of doing the splits, but doing so leaves a quarter-inch gap between her legs that’s just awkward. All the figures in this line that I’ve seen have this problem. I find it particularly odd, since the leg mechanism is essentially the same as Mattel’s DC Universe Classics line, and there it’s less noticeable. 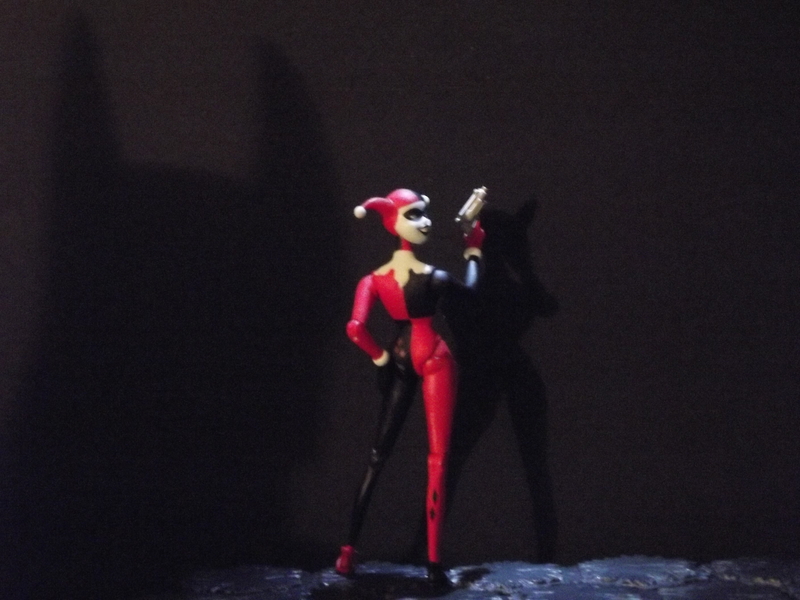 A surprising articulation choice is the lack of turning waist for Harley. It was a costing choice masked as a design choice, I think. You could easily have a bending waist at the horizontal line under her chest. Hasbro has shown with their recent Marvel Legends females these days that turning at the chest is a good compromise for female bucks. At the very least she should have had an ab-crunch. Cirque du Soleil dancers don’t arch their backs as much as Harley Quinn does. Make sure you get my good side, Batsy-baby. Thanks for the peachy new exercise machine, Mistah J! I knew you didn’t forget my birthday! Another problem this figure, and most of the figures in the line, have is that Timm designs characters with really, really tiny feet. 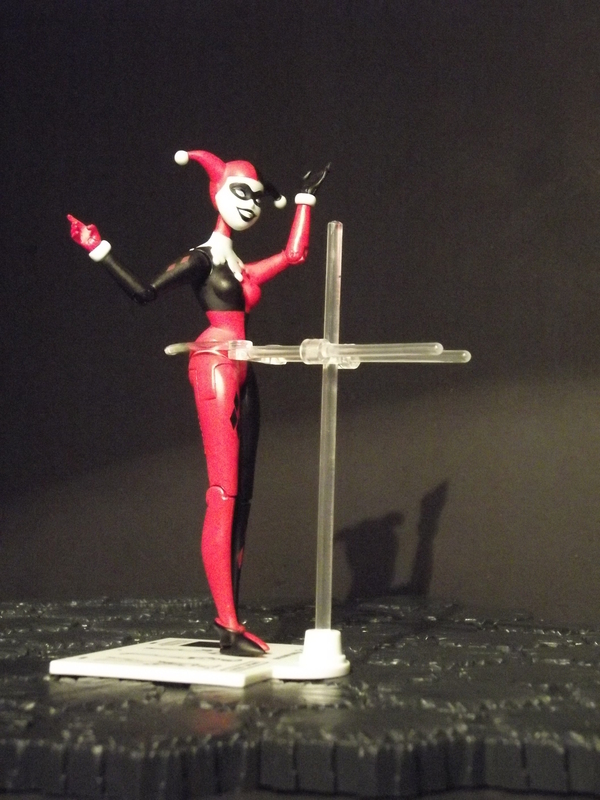 These tiny feet make it incredibly hard to balance Harley on her own, and the stands that come with this line are ugly. They look like some kind of bad trap from a Batman ’67 villain. 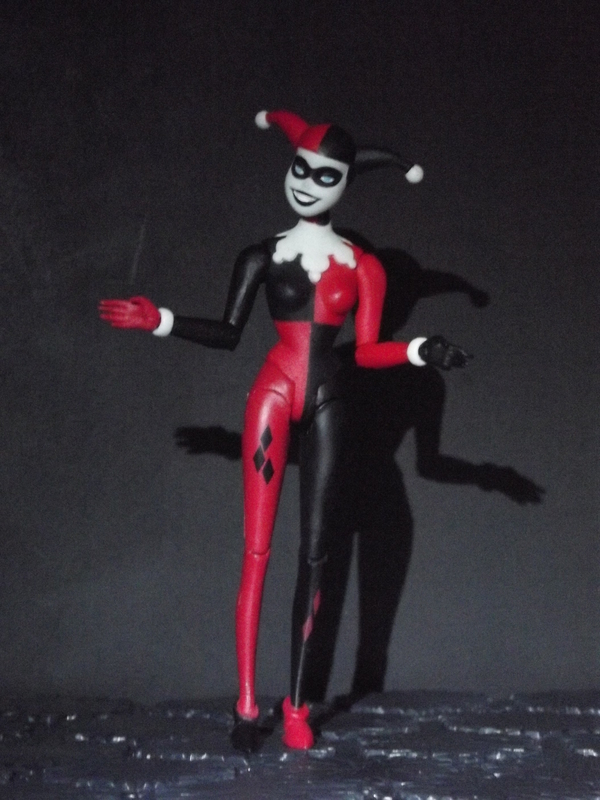 Even with all the problems, though, this is probably the best Harley Quinn figure available for the money. DC Universe Classics is a distant second. It’s a must have for any fan of the character or the series. I hope you will enjoy this challenge! Thanks! I updated my old Liebster nod from a few years back to include your nomination. Thanks again.